As part of a conceptual master plan for a number of downtown streets, the California Street Bridge design reconnects downtown Ventura with the coastline. Ventura’s rich urban and architectural heritage was disrupted when the 101 Freeway replaced Thompson Boulevard as the primary highway connecting Los Angeles and San Francisco, leaving only two downtown connections between the city center and the beach. The California Street Bridge, one of these two links, is generally at natural grade, with the sunken freeway passing below. Ventura’s Downtown Specific Plan, initially prepared in 1992, identified improvements to the appearance and pedestrian amenities of this bridge as an opportunity to reconnect the downtown to the ocean. 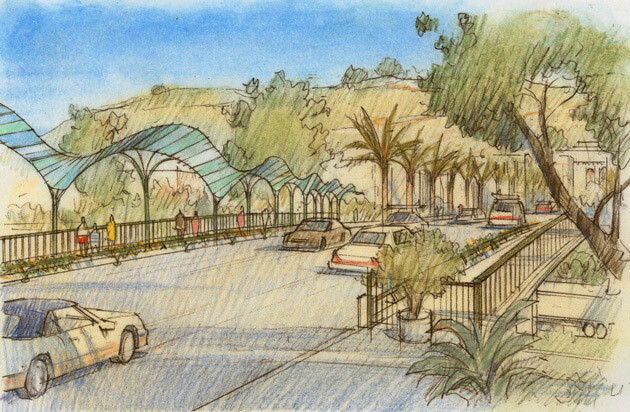 As part of Ventura’s Art in Public Places program, artist Michael Davis was selected to prepare design concepts for transforming the bridge and Moule & Polyzoides collaborated with Mr. Davis to develop a design for construction. The Moule & Polyzoides concept employs a series of vertical light elements that creates a gateway between beach and town, providing a visual procession from city to the ocean.